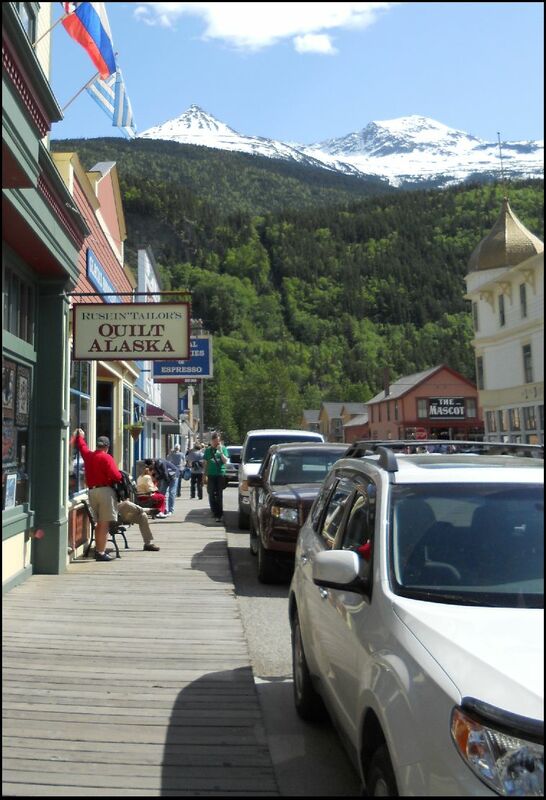 On to Skagway. I stopped and asked the same question. 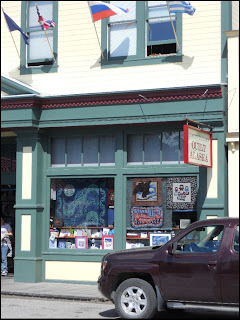 Yes, there is a yarn store in the downtown area called -- well -- it seems to have three names. The Rushin Tailor (isn't that cute? 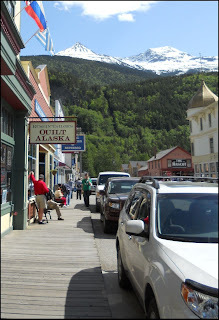 ), QuiltAlaska and Changing Threads. All three are in the same building, and I'm not really sure if they are different stores or not. I went back and took some pictures. Look in the background. 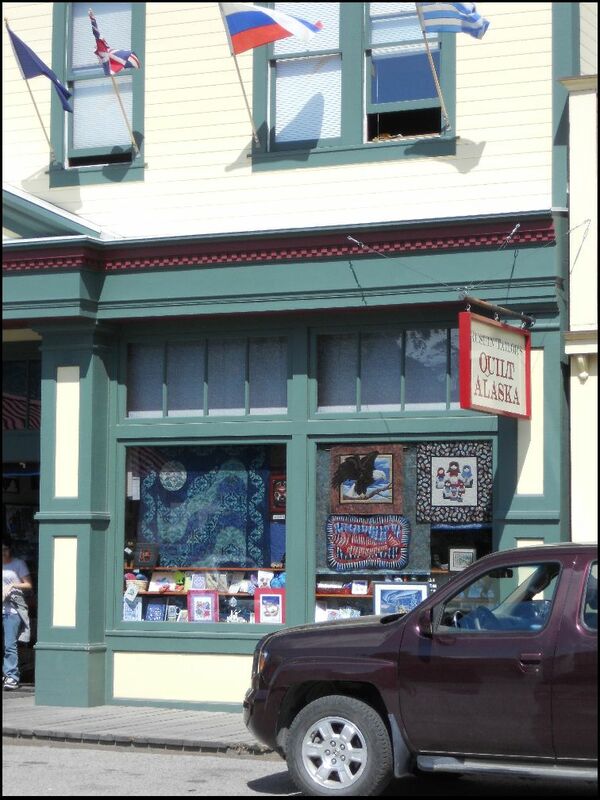 Wouldn't that be a wonderful view from the doorway of your shop? They had beautiful, hand-dyed yarn from two companies (at least) -- Raven Frog Designs and Rabbit Run Designs. I brought three skeins from Rabbit Run: two worsted wool and a 75% wool/25% nylon. The two worsted wool yarns are from the Water colorway and the Wildberry colorway. They match beautifully, so I think I'll knit a scarf that alternates between the two. 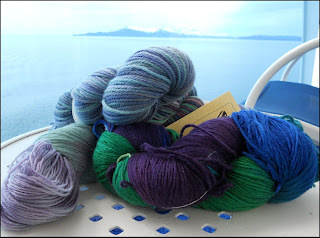 I brought a skein of wool that was greens and lavender - called hyacinth. Socks, I think, although it will be a thicker sock yarn. I like that! The fourth skein is from Raven Frog, and it is a superwash merino. The colorway is Princess Matsoutoff's Gown -- green, royal blue and purple. I bought it because I loved the colors. Another scarf? Maybe the Yarn Harlot's one skein scarf? Who knows? I may just look at it. If you look at the picture, taken on our cruise ship balcony (what a joy in itself! ), all four yarns are there. The one at 12:00 is Water, the one peaking out at 2:00 is Wildberry. The blue/purple/green on is from Raven Frog Designs, and the Hyacinth yarn is pointing to about 8:00. As for my current project, I am still working on the cabled shawl from Folk Shawls. I like it. It's enjoyable to knit, and the pattern was easily memorized. Just four rows, repeating across the wide width of the yarn. It's dark blue. I can't knit it in dim light, but otherwise, it's pretty simple. Lots of cables. Not boring.